Through the ages men in their quest for God have slipped away from the crowds to the solitude of quiet places. Over a century ago, our forefathers began their trek to the open spaces to live awhile in tents and worship the Creator free from life's routine. Tent meetings, the springboard for many churches, gradually gave place to the larger convocation called a camp meeting. 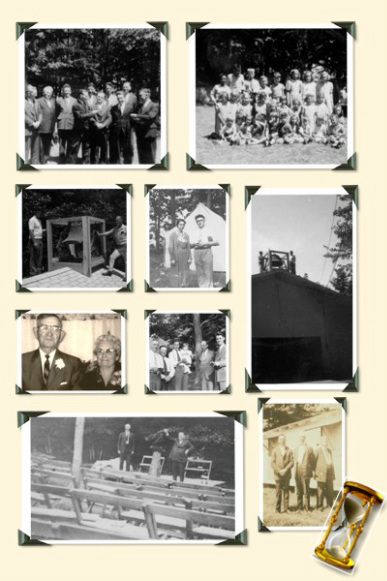 The earliest written records, some borrowed from our sister camp in Brown City, indicate that Mancelona Family Camp meetings have been taking place since the 1930’s. Prior to the purchase of land, camp meetings were held in Palmer Park located in downtown Mancelona. The first 5 acre parcel, of what is now known as Mancelona Camp, was purchased in 1955 facilitated by the Mancelona United Missionary Campground Board of Directors which consisted of 9 men (George Waun, Charles Thompson, Eugene Sims, Elias Bassett, Willard Williams, Homer Matteson, Mark Burgess, Harold Moore and Robert Beihl). An additional 10 acre parcel was purchased in 1966 with the latest 12 acre purchase transacted in 2008 giving Mancelona Camp a total of 27 acres. Mancelona Camp, in the spirit of fellowship, stewardship, and mutual responsibility, is committed to expanding the Kingdom of God through the ministry of the Word of God to the needs of all participants. This Statement of Purpose was derived from the following core values that we believe reflect the mutual desire for continued growth and development of Mancelona Camp, which we see as a treasure from the Lord. 1. Growth - To seek new persons to whom we can minister in the areas of need common in today's society. 2. Youth - To impact our young people by challenging them with the Word, equipping them to become Christ-like through evangelism and discipleship. 3. Finances- To be a self-sustaining and debt free ministry able to expand with our vision. 4. Ownership - To create an atmosphere of belonging, purpose, and enthusiasm where people desire to participate in meeting the needs of Camp.